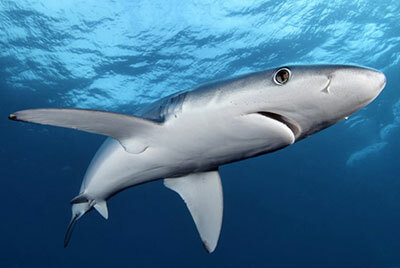 The Blue Shark is one of the most attractive and graceful of the worlds Sharks, With its indigo-blue colouration, it is also one of the easiest species to identify. Mainly an open-ocean shark, but may venture inshore around oceanic islands or in areas with a narrow continental shelf, such as off the coast of Southern Africa around the False Bay and Cape Point areas. Temperate to tropical waters worldwide. The most widespread, and one of the most abundant, oceanic sharks, but some stocks seriously reduced by overfishing. Blue Sharks will approach kelp forests, such as are found around the southern tip of the African continent, from Cape Point to Cape Agulhas, in temperate waters. From the surface down to at least 220-meters. Prefers relatively cool waters and, while common at or near the surface in temperate waters off the Cape, tends to occur at depth in the tropics. Higher-latitude populations tend to be migratory, but lower-latitude populations are mainly resident. They are viviparous, with a yolk-sac placenta, delivering four to 135 pups per litter. The gestation period is between nine and 12 months. Females mature at five to six years of age and males at four to five. Courtship is believed to involve biting by the male, as mature specimens can be accurately sexed according to the presence or absence of bite scarring. 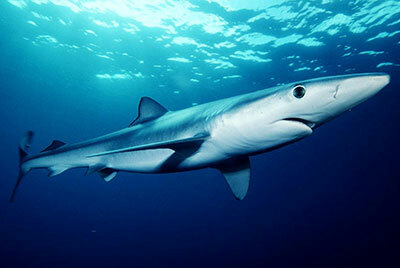 Female blue sharks have adapted to the rigorous mating ritual by developing skin three times as thick as male skin. Blue Sharks have uncanny ability to turn up at the right place at the right time to gorge on seasonally abundant food, whether it be an annual glut of bait fish, such sardines, pilchard, or snoek, mainly bony and cartilaginous fishes, squid, octopuses, crustaceans, mammalian carrion, hence they are notorious for turning up at the floating carcasses of dead whales, and occasionally also seabirds. They often gorge themselves to bursting, sometimes regurgitating everything and starting all over again. It is often seen at the surface, especially far south of Cape Point with its pectoral fins outspread and its first dorsal fin and upper caudal lobe out of the water. The likelihood of encountering a Blue Shark when on a diving trip to South Africa? Blue Shark are encountered with the Mako Shark about 35 kms south of Cape Point, in the cold waters, between 12°C and 16°C, and in amongst the “kelp rafts” floating on the surface of the water. Please note that the Sharks have not read this timetable so they have no idea where they are supposed to be, and when. This Timetable is purely a guide! Remember, our daily average winter month temperature is higher that the UK average summer month temperature. TIME: Trips depart Simon’s Town Small craft harbour @ 06h00 and return at 16h00 depending on shark activity. WEATHER DEPENDANT: All trips are weather dependent and are subject to cancellations based on bad weather. In this event a full refund is offered. For the first time in Africa; Dive The Big 5 offers you the opportunity to come face to face with various predators of the deep. This is an opportunity that has no match. 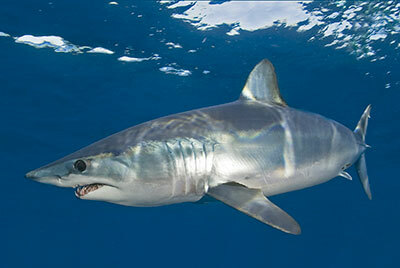 The blue water predators that we are searching for are the magnificent Mako Shark and the Blue Shark. These creatures rule this blue world known as the pelagic zone. From October to May each year the warm Agulhas current sweeps along the east coast of South Africa bringing with it its clear blue water that teems with life. It is when this clear blue warm water arrives that we head off in search of our blue water predators. Not only the Sharks, but also large Yellow Fin Tuna (that we have successfully dived with) as well as their smaller relatives the Long Fin Tuna. Our adventure truly begins when head around the Cape of Good Hope, better know as Cape Point the place were the two oceans meet. We will venture out anywhere from 15 to 30 nautical miles in search of our elusive quarry. For naturalist wanting a bit of everything then this is a must, because from the moment we get out of False Bay we start to see wildlife that land lovers will never see, a multitude of pelagic birds can been seen including Skuas, Terns, Shearwaters, petrels, penguins as well as the possibility of seeing up to six different species of Albatross. Whales and dolphins of many species are also regular visitors on our run out into the deep. Using the latest high-tech sound equipment emitting low frequency sounds, we attract these masters of the deep right up to our vessel. Here you will have the opportunity to view these animals gracefully swimming around our boat or if you want to dive and are qualified to do so you will be accompanied by one of us into there world. Other shark species that have been spotted include Thintail threshers Smooth as well as Great Hammerhead Sharks, these species are rare and should not be expected on a regular basis. 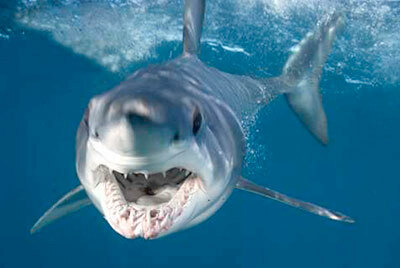 Mako sharks have the ability to make prodigious leaps out of the water and this can been observed if you are lucky. The Mako shark has long been feared as a man-eater, yet our experiences have proven this otherwise, it is with its magnificent cobalt blue dorsal surface and snow white belly truly one of the most beautiful creatures of the ocean. While we wait for the sharks to arrive we have regular visitors to the boat; Long fin and Yellow fin tuna game fishing is a good way to pass the time. The average sizes of the Mako’s are around 5ft but we do get visitors of up to 10ft+, observing any Mako is a truly fantastic experience. Blue sharks respond the best of all to our sound equipment and on regular basis we have dozens of Blue sharks and a couple of Mako’s around our vessel, making for a magnificent sight. Blue sharks are afraid of very little and will approach diver with a lot of interest, only satisfied after a close inspection that you are not a food item; this is great for photos and memories. These two species of sharks are truly the great BLUE WATER PREDATORS.